It seems 3D printed food lasts longer than any solution offered to Astronauts and since it's print on demand there's a good chance we're seeing the future. While astronauts may not have Star Trek’s food replicator just yet, they may get to enjoy pizza parties in space in the not-too-distant future, thanks to the robotics company BeeHex. Born of a NASA project, the Ohio-based startup is investigating alternative methods of feeding astronauts on deep space missions with 3D printing technology. “We’re also exploring possibilities to ‘harvest’ matter from space, separating consumables and reconstituting them for greater variety and efficiency along a mission,” explains French. While NASA has upped its food game for astronauts in recent years, even investing in a vegetable garden in the International Space Station, astronauts will face unique challenges when they leave our planet’s orbit sometime in the 2030s on their mission to Mars. NASA explains on its website that astronauts aboard the Orion likely won’t have the luxury of choosing between 200 food items and stowing bulkier food items on the long trip like those on the ISS. They also won’t be able to restock their food supplies in deep space. 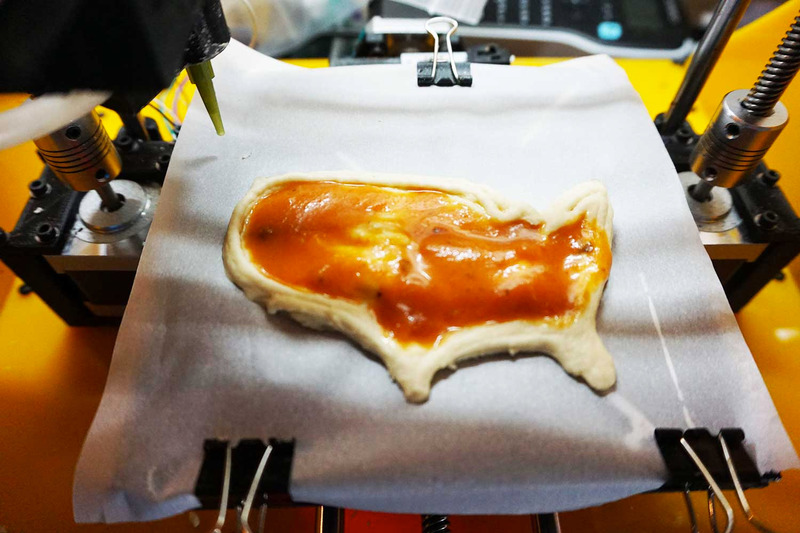 But BeeHex’s food printer, the Chef 3D, could theoretically alleviate some of these challenges. “In powder or other forms and also separated granularly by ingredient—down to acids and inorganics—3D printed inputs can last years,” says French. “That longevity is one likely driver behind NASA’s interest in flexible 3D food printers that will be designed for deep-space missions.” Of course, NASA is looking into several options when it comes to feeding astronauts on the Mars mission, and they’re also getting food scientists to develop dense 700-900 calorie “food bars” that could serve as meal substitutes (but if you ask me, I’d rather have a pizza). While it may be a little while before we shoot human beings off to Mars, BeeHex has plans to revolutionize the way we eat down here on Earth in the meantime. The startup recently raised a $1million seed round, after partnering with Jim Grote, founder of the commercial kitchen equipment manufacturer the Grote Company in Columbus, Ohio. They plan to market the Chef 3D to companies that produce food for large groups, such as music venues, cinemas, the hospitality industry, grocery stores and more. So hopefully this means an end to that cardboard-tasting frozen pizza and stale nachos at big events. “Expect to see robot chefs at restaurants, theme parks, sports venues and high-foot-traffic events,” says French. 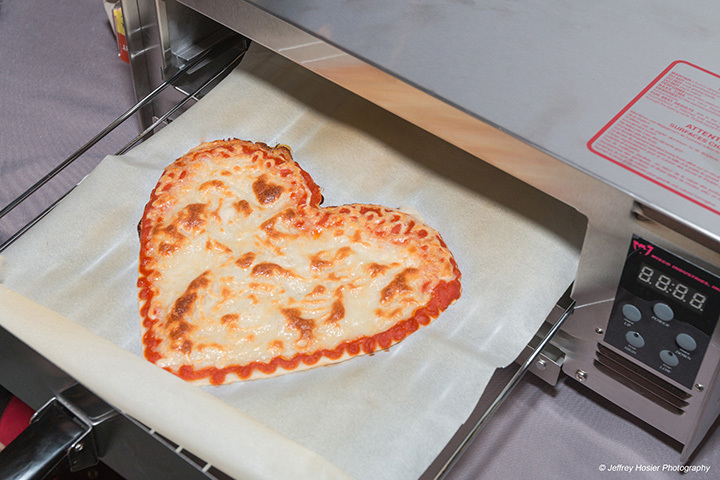 A big benefit of robot chefs is the fact they can crank out pizza way faster than any human. 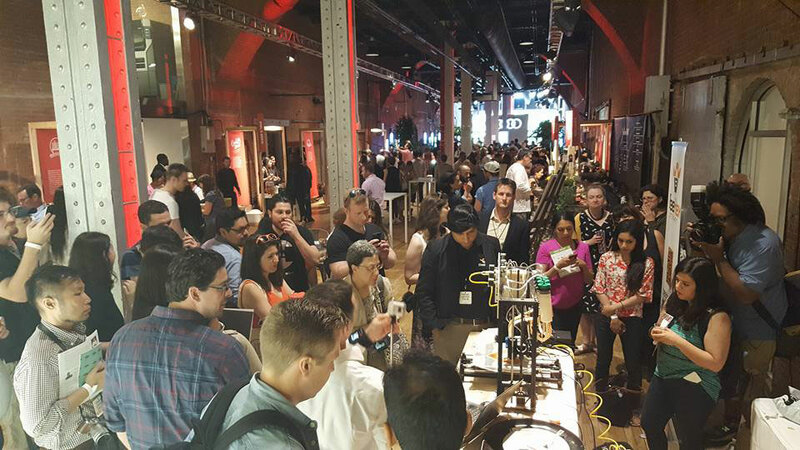 BeeHex has been working on making the robots dish up pizza as fast as possible: They started with a six-minute print time in 2016 for a 12″ pizza and shaved that time down to a minute by the end of the year. Despite popular belief, “fast food” isn’t necessarily synonymous with “unhealthy.” When it comes to 3D-printed food, the nutritional value of your food depends entirely on the ingredients you fill your printer with, and BeeHex has been making a point of using fresh ones. Last year, they teamed up with chef Pasquale Cozzolino who owns the New York and Atlanta-based pizzeria Ribalta and made some yummy-looking Neapolitan pizza, with an 80-year old “mother yeast” and “tomatoes from Mount Vesuvius and mozzarella made from the milk of Neapolitan cows” (according to a BeeHex’s press release). Another selling point of the Chef 3D is the fact that customers can easily pick and choose the ingredients depending on their preferences. “Our marketing surveys have shown very high interest in food personalization, especially among young generations,” says French. So for all us millennials who grew up on fast food culture, but now have a million allergies, this could be a dream come true. Now, I’ll have a gluten-free heart-shaped pizza with free range sheep chèvre, please. Make it snappy! 3D printing is a really cool idea. I could see a specialty pizza place bringing a bunch of these out each week. Maybe a theme type of pizza and stuff like that. 3D printing is pretty big and honestly, I love watching how they work! 🙁 I get sad when I see stories like these. The money that goes into a project like this could really be used for something sustaining. Rather it goes into something like this that seems created just because the money is there.